Venus is not a place you'd want to hang out for any length of time. Its atmosphere is dominated by sulphuric acid rain which falls out of clouds but evaporates before it hits the ground due to the intense heat. But it's the winds that get astronomers back on Earth excited. Venus' winds blow around the planet 60 times faster than it rotates. To try to figure out why, astronomers have studied the Venusian atmosphere for decades, but it's tricky because we can only see the half of the planet that the Sun is illuminating. And the computer models that we've built from those day-side observations don't deliver the crazy wind speeds we see in reality. It's clear we're missing something, and it's probably hiding on the planet's mysterious night side. 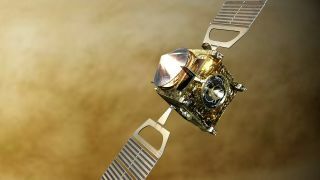 Now, thanks to the European Space Agency's Venus Express probe, we're finally getting a glimpse at that night side. A team of exometeorologists has used an instrument on the probe called the Visible and Infrared Thermal Imaging Spectrometer to scan the night side's cloud systems. "We focused on the night side because it had been poorly explored," said Javier Peralta of the Japan Aerospace Exploration Agency, the lead author of a new study published in the journal Nature Astronomy. "We can see the upper clouds on the planet's night side via their thermal emission, but it's been difficult to observe them properly because the contrast in our infrared images was too low to pick up enough detail." The pictures they were able to obtain with Venus Express, however, reveal phenomena that have never been seen on the day side. The rotation there is more irregular and chaotic. "It was an exciting moment when we realised that some of the cloud features in the VIRTIS images didn't move along with the atmosphere," said Peralta. The next step is to integrate those features into the models to see if they help explain our observations. "This study challenges our current understanding of climate modelling and, specifically, the super-rotation, which is a key phenomenon seen at Venus," said Håkan Svedhem, ESA Project Scientist for Venus Express.